As previously discussed, the sensor in your camera has a lower dynamic range than your eye. That means you can perceive colour and shapes in deeper shadows and brighter highlights than your camera can. This can be solved with High Dynamic Range (HDR) photography. That is, taking a sequence of bracketed exposures and merging them into a single image in post. Typically, this means starting with an underexposed image and adding one stop of light by progressively doubling your exposure time until you have an overexposed image. In reasonable lighting conditions, I prefer to shoot -2, 0, +2, where 0 is a proper exposure, -2 is two stops underexposed, and +2 is two stops overexposed. After shooting the sequence, be sure to check the upper and lower exposures. If the lower exposure still has some blown highlights, keep going down until you've captured all of the detail you want. The same thing goes for the upper exposure. If there are still some deep shadows you'd like to see into, keep going up until you have captured all of the shadow detail you want. In bad lighting conditions, I've shot over 9 stops worth of exposures. Don't be afraid to push it. You can always delete exposures later, but you can't go back and get more. 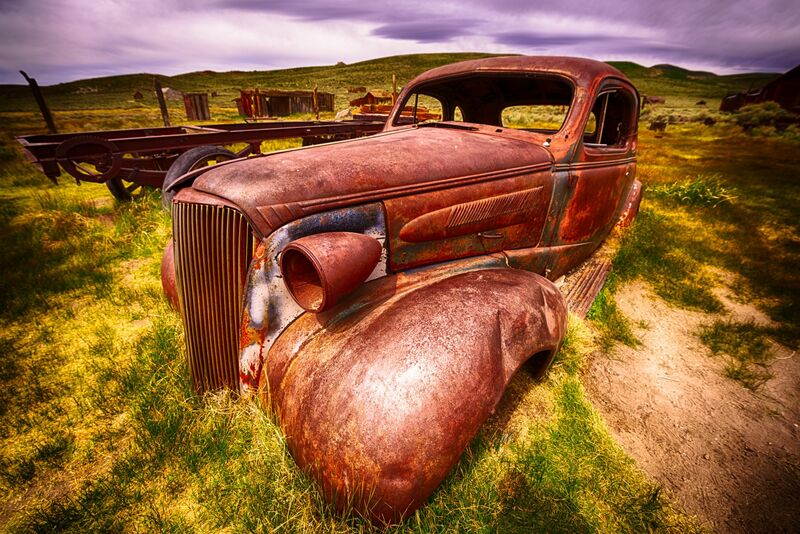 A 7 exposure HDR of a rusting car in Bodie State Historic Park, California. First and foremost, you absolutely must use a tripod. Anyone that says otherwise is lying to you. HDR software packages have an image align feature that will claim to be able to align images that were taken hand held and have slight movement between each frame. This is a lie. It will make a best effort attempt to align the images, but I guarantee there will be garish artifacts, which are usually the most visible around sharp edges. Just avoid the whole problem and shoot with a tripod. Similarly, moving objects in your frame will cause ghosting. Some HDR software packages are better than others at reducing/removing ghosting, but the truth of the matter is that there will still be artifacts. Thus, it's best to avoid shooting HDRs of moving subjects. Or, utilize the Single Shot HDR technique in the next section. Unrelatedly, most cameras are configured to focus when the shutter is half depressed. This can cause focus creep when shooting HDR images. To prevent it, focus your camera before shooting the sequence, flip the lens into manual focus mode, then shoot the sequence. That way, when you half depress the shutter on your way to fully depressing it to take the next image, the camera won't attempt to refocus and possibly change the focal plane in the middle of your sequence. Last, but certainly not least, HDR processing can flatten the image, sometimes leaving an undesirable lack of depth or three dimensionality. By brightening shadows and reducing highlights, the perception of depth can be lost. You'll simply have to experiment with how much tonal compression is good for each image.